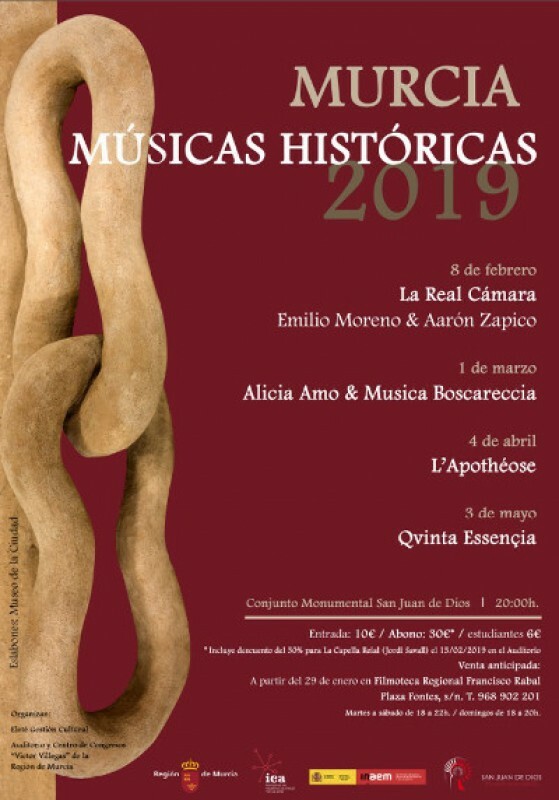 A cycle of concerts in which Works by Boccherini, Händel and the German composers of the early 18th century is being held at the Conjunto Monumental San Juan de Dios in Murcia in the city of Murcia, featuring performances by La Real Cámara, Alicia Amo and Musica Boscareccia, L’Apothéose and Qvinta Essençia. The aim of this cycle is to bring back to life for today’s audiences in Murcia music which belongs to the past but which draws together history, tradition and culture. The concerts begin at 20.00 in San Juan de Dios with tickets priced at 10 euros (6 euros for students, pensioners and the unemployed) while the last is part of the Murcia Tres Culturas festival held by the Town Hall. Concerts within this event are normally free of charge. 4th April: L’Apothéose present “A tribute to tears”, a selection of baroque pieces by Händel. 17th May: Qvinta Essençia perform “Luca Marenzio: Libro primo di madrigali a quattro voci”, containing some of the finest madrigals from the first book by Luca Marenzio.